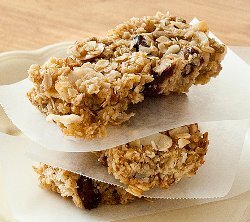 If you've never tried to make homemade granola bars, then you should definitely try these! Super easy & super tasty! Mix brown sugar, honey and peanut butter in a small sauce pan. Stir over medium heat until just boiling. Add to cereal mixture along with vanilla extract, cinammon, salt, peanuts, coconut and chocolate chips. Press into the prepared pan using a spatula, spoon or your hands. (I press down with tin foil or wax paper). Set aside to cool (I have found placing them in the freezer for 15-20 minutes helps them set the best), then cut into bars. Mix brown sugar, honey and almond butter in a small sauce pan. Stir over medium heat until just boiling. Add to cereal mixture along with vanilla extract, cinnamon, salt, almond pieces, cranberries and while chocolate morsels. Press into the prepared pan using a spatula, spoon or your hands (like I do). Set aside to cool, then cut into bars. * To keep chocolate from melting into mixture try freezing it first as well as adding the morsels towards the end of mixing process. * Once the bars have cooled I place a cutting board on top of my pan and then flip the pan upside down onto the cutting board. I can then lift the pan off, remove the saran wrap, and cut into bars. * Bars taste great if frozen…. Once thawed they retain the chewy texture however I would avoid refrigerating the bars as this seems to dry them out. * To keep fresh store at room temperature in a sealed container. * Try swapping out the crispy rice for cereal that you already have on hand… corn flakes, cheerios, etc. This looks great.I will try this recipe.These tips are really useful and i would like to follow your tips.Thank you so much for this wonderful recipe.